US bank Wells Fargo has entered the world of online role-playing in an effort to teach young people the basics of managing their money. In the bank's Stagecoach Island game, players explore an imaginary world using virtual money, which they earn by answering financial questions. A pilot version of Stagecoach Island was launched for young adult Texans in San Diego and Austin over the Labor Day weekend earlier this month. The pilot will run until mid-November. 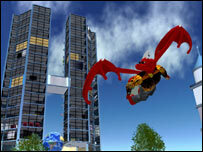 Participants in the game can explore a virtual island with many different activities. Some of these are "free" but others, like buying clothes or going to a club, require virtual cash. Players can earn this by going to the Virtual Learning Lounge and giving the correct answers to trivia questions about saving, managing money and budgeting. Wells Fargo's chief marketing officer Sylvia Reynolds said the aim was to reach young people who were leaving home and becoming financially independent for the first time. She described the game as a way of educating them in "a highly interactive, comfortable and fun environment". Technology analysts say the bank's venture is part of a trend towards using online role-playing games designed for entertainment in a more serious way. At least two US business schools are exploring ways of using Second Life - which has 45,000 participants - to help foster their students' entrepreneurial skills.